At Tinfoil, we often strive to follow in the footsteps of companies we look up to. One event we’ve taken from some of our favorites (Stripe and Baydin) is our annual work away. Work away is a trip away from the (SF)Bay Area and tends to be 70% work and 30% play. We work on unique projects that we’ve wanted to experiment with, but that may not have an immediately obvious benefit for our customers. It’s a great time for R&D and learning. Apart from work, each work away has fun events, bringing us closer as a team. Here is a quick overview of how we included some fun during the time away: Beach time, island excursions, lobster bakes, brewery tours, bunker exploration, Seafood Festival visits, parasailing, “spontaneous” pool breaks (either in the cabin’s pool, or with the pool table.. I have learned I was ambiguous when scheduling! ), hiking, escape the room games, cooking dinner in groups, playing board games, and treating the team out to fancy dinners. This week marks our third annual work away. As our team has grown since our first work away, and we are now comprised of much more than just engineers,work away has definitely evolved. Each evolution has brought different and valuable learnings for each team member's personal and professional growth. Though having a full team at work away is hard once you start growing to a larger team size (16+), we always come out stronger because of it. Our first work away was amazing. We headed to the beach in New Hampshire. Luckily there were enough nooks and crannies to shove extra beds and cots for at least 12 people. It was incredibly affordable, and an eye opening experience for me as a CEO. We had some employees drastically grow into the team during this time away. One employee showed that, though he was from a small suburban town, he could speak enough fluent Mandarin to get us through an escape the room game in half the time. It was the first time some of our employees had ever seen an ocean. We all stayed up late playing board games and building stronger bonds, supporting the familial culture we embrace. Our first work away project was really just for engineers, as that’s what we all really were. We built a deployment manager (which we lovingly call Arceus internally), and it has saved us hundreds of hours of time. All of our engineers are polyglots, picking the right language and tools to get the job done, meaning we have a lot of varied projects, each with its own build tooling and deployment tooling. This gave us a singular place to track the status of and release new deployments, allowing us to release things concurrently. Focusing on our tenet of automation, it brought our release engineering efforts from a hefty manual process to only requiring a few hours a week of a single engineer’s time. As with any new trial, we did have efforts that failed, but all of our failures were useful learnings. Our second work away was the first time we had non-technical people joining the team and wasn’t nearly as successful as our first. We repeated the venue (though we changed up the fun things, other than the escape the room game... that’s a permanent event now! ), which still worked out great. Our engineers decided our second work away would be spent focusing on learning new things, not specifically focusing on a single project. Our goal was to bake off different frontend technologies to learn their pros and cons. It ended up being marginally useful, but not as useful as the first. We’ve learned that, for our team, work away projects need to be planned, at least at a high level, so we know what we’re looking to get out of it. We did learn the lay of the land with specific technologies we had interest in, but missed the concrete finished product. Our marketing lead joined us one week before work away. She had a much more successful work away than the engineering team. She was immediately immersed in the team (which usually takes a few months of walks and lunches) and came up with a concrete set of goals for the upcoming year. She started to explore new designs for our collateral and brand, took some team headshots, purchased important equipment, and outlined goals for PR for Tinfoil’s founders. She got immediate face to face time anytime she had questions and her learning curve was drastically less steep than it otherwise would have been. We’re a team that cares about teaching, and anybody wanting a break was happy to teach her something new! This brings us to this week’s work away. We arrived 2 nights ago, and are just getting into the swing of things. I hope this work away is the best yet. We’re a larger team. Our engineers are working on a fun project to learn more frontend development as a group. They’re building a platform to enforce our curiosity value and collect team members’ learnings throughout the day. Our marketing team is creating a new yearly plan from this year’s learnings. They’re adding new OKRs, scoping out new technology we’ll need (or need to build) for new marketing efforts, and are solidifying a highly technical white paper for our customers. Our HR and administrative folks are finishing up a new version of our handbook and then helping to support the marketing team. Sales and support are collaborating on automated tools to increase communication between the two teams. 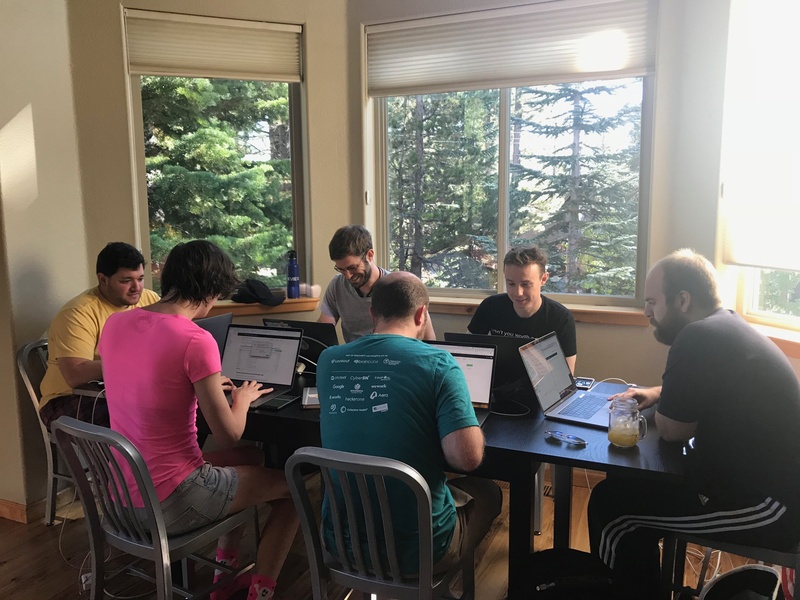 And our new government sales team is taking a week to think outside of the box and build tooling to assist in automating government sales and business intelligence, embodying Tinfoil’s hacking value. We’re sitting in Tahoe to shorten this year’s travel time. We’ve taken a page out of our retreat book and create cooking teams for dinner, but so far we’ve got a wonderful, relaxed dynamic of team members pairing and collaborating amongst different teams. It’s exactly how I want my company to work - this is how we make the most progress, get new ideas, and don’t forget about edge cases. Work aways don’t have to be expensive. They don’t have to happen every quarter. They do seem to have an effect on our team. I love to encourage other startups and organizations to consider work aways for their teams as an alternative way to bring their team together and maybe get a new project off the ground that could have a large impact on their productivity or customers. Hopefully this helps you see a different perspective. Feel free to follow our Facebook or Twitter as we post updates during this year’s work away. As with anything I post, I welcome any questions and comments - I’m always trying to take feedback to keep growing.